Well he had nice but sad things to say about New Zealand’s contribution to that horrendous conflict. It seems servicemen from my country died in greater numbers relative to population than those of any other combatant nation – a dubious honour, you’d have to think. Does that make our boys braver, more stupid, or just unlucky? In the interview I read, Prof. Winter then proceeded to devote a lot of words to making a connection between New Zealand’s joining the ill-fated Gallipoli invasion, and another tragedy of the “Great” War, the deaths of thousands of Armenian civilians. 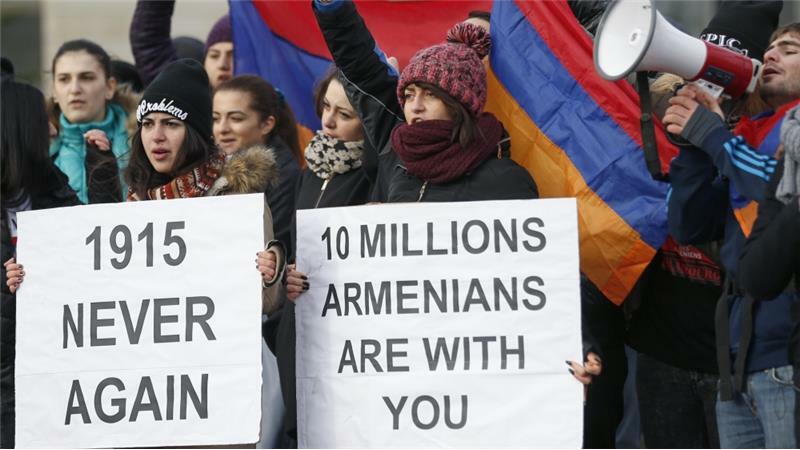 The link is the date: 24 April is when Armenians remember the day in 1915 when their ancestors in SE Anatolia were rounded up by the Ottoman government and forced to “relocate” to what is now Syria, a lot of them dying on the way. On 25 April in the same year, the British Empire, following a plan championed by War Minister, Winston Churchill, landed on the beaches of the Gallipoli Peninsula in a vain attempt to take the Ottoman Empire out of the war. Naturally, historians, jealous of their professional reputation, would like to think so – but the sad reality is that history, like economics, is a social science, lending itself to interpretation according to the particular political or ideological lens one uses to view the “facts”. Prof Winter gives a clue to his real purpose in visiting NZ when he suggests that the country’s new “Labour” government may be amenable to joining the ranks of other self-righteous nations that have officially designated the Armenian tragedy “a genocide”, for which the modern Republic of Turkey should be held responsible. He may be right. Self-styled left-wing parties in the wealthy First World, bereft of ideas for actually changing anything important in the lives of the planet’s 99%, tend to offer crumbs of trendy, fashionable issues to their diminishing ranks of supporters. Barack Obama, in his original presidential campaign, wooed the Armenian lobby, but changed tack later, for reasons best known to himself. 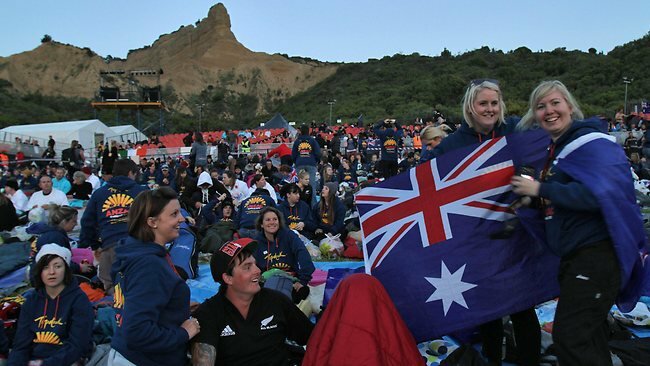 Wiser heads may win the day in NZ too, and not simply because they fear that offending Turkey may earn their globe-trotting citizens a chillier welcome on their annual pilgrimage to Anzac Cove on 25 April. Nothing necessarily wrong with that, of course. Everyone has to make a living, and I’m sorry to hear those guys are distressed. However, the page where that interview appeared contained a link to another article praising “a young Kiwi historian” James Robins, who is apparently “grappl[ing] with the fact that no New Zealand Government has ever formally recognised the genocide of Armenians”. Mr Robins’s “grappling” is supported by a “genocide expert”, Maria Amoudian, and an American heavy metal musician Serj Tankian. In the interests of academic objectivity, we might want to also take a look at the work of researchers with less obvious connections to the Armenian diaspora. One such is Edward J Erickson, a retired regular US Army officer at the Marine Corps University in Virginia, recognised as an authority on the Ottoman Army during the First World War. He makes some interesting points in a paper entitled “The Armenian Relocations and OttomanNational Security: Military Necessity or Excuse for Genocide?” I’m quoting a chunk from it, but you really need to read the whole document. It’s only 8 pages long. the Ottoman counter-insurgency policies and practices in the late nineteenth and early twentieth centuries. the inability of the Ottomans to mass large forces effectively and rapidly to quell the insurgency. “With respect to the question of whether the relocation was necessary for reason of Ottoman national security in the First World War, the answer is clearly yes. There was a direct threat by the small but capable Armenian revolutionary committees to the lines of communications upon which the logistics of the Ottoman armies on three fronts depended. There was a real belief by the government that the consequences of failing to supply adequately its armies that were contact with the Russians, in particular, surely would lead to the defeat of the Ottoman Empire. The Ottoman high command believed it could not take that chance. Pressed by the imperative of national survival to implement an immediate counterinsurgency strategy and operational solution, and in the absence of traditionally available large-scale military forces, the Ottomans chose a strategy based on relocation— itself a highly effective practice pioneered by the Great Powers. The relocation of the Armenian population and the associated destruction of the Armenian revolutionary committees ended an immediate existential threat to the Ottoman state. Although the empire survived to fight on until late 1918 unfortunately thousands of Armenians did not survive the relocation. Correlation is not causation and the existing evidence suggests that the decisions leading to the Armenian relocations in 1915 were reflexive, escalatory, and militarily necessary, rather than simply a convenient excuse for genocide. Another article you might want to take a look at appeared in The Washington Times, in 2007, around the time Barack Obama was running hot on the Armenian issue. “Armenian crimes against humanity and war crimes against the Ottoman Turkish and Kurdish populations of eastern and southern Anatolia during World War I and its aftermath have been forgotten amidst congressional preoccupation with placating the vocal and richly financed Armenian lobby. and all the world will live happily ever after. No need to study history. Will we ever know the truth? Who knows? But one thing is for sure: if you want to stand a chance of learning it, you need to keep an open mind and do your own searching. And beware of “expert” historians (and economists). With the opening of the Assembly, Ankara became the center of the Turkish national struggle for liberation. The National War of Liberation culminated in the emancipation of Anatolia from foreign occupation, the international recognition of modern Turkey’s borders by the Treaty of Lausanne, and finally, the founding of the Republic of Turkey on October 29, 1923. October 29, or Republic Day, is an official Turkish holiday celebrated each year across Turkey and by peoples of Turkish heritage worldwide. The Sykes-Picot Agreement -Who’s to blame? This Thursday, May 19, will mark one hundred years since the concluding of an agreement signed in secret by the three Entente Powers in the First World War. Britain, France and Czarist Russia, anticipating victory and the final demise of the Ottoman Empire, drew up a document carving up the Ottoman domains and divvying them up amongst themselves. When the victorious Bolsheviks made the agreement public after the Russian Revolution of 1917, it was something of an embarrassment for the British and French governments. Nevertheless, they went ahead with their plans, and the post-war Treaty of Sevres was an attempt to implement the provisions determined by Mr Sykes and M. Picot. There is a debate going on in Western media at present over the extent to which those two gentlemen are to blame for the ongoing conflicts in the Middle East. 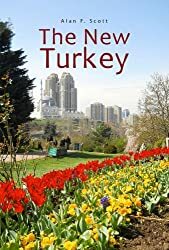 There seems to be a significant body of opinion on the affirmative side, arguing that the post-WWI division of Ottoman territory was based on self-interest, without regard for on-the-ground realities. The result, they say, was the current national borders that pay little or no attention to the ethnic and religious composition of the local people. This is one of the key wrongs that the ISIS/Daesh people claim they want to set right. On their part, the opposition play down the importance of Sykes-Picot on the grounds that: A. It was never fully implemented; B. Messrs Sykes and Picot didn’t really know what they were doing; and C. Hatreds and conflicts in the region go back millennia. Implicit in this position is the argument that the Western allies should not be held responsible for Middle Eastern chaos. First of all, there can be little doubt that Sir Tatton Benvenuto Mark Sykes, Baronet, and François Marie Denis Georges-Picot were acting on the authority of their respective governments. You can’t weasel your way out of that, guys. Second, while it is true that the Sykes-Picot agreement was not implemented in full, it wasn’t for want of trying by the French and British governments. The 1918 Mudros Armistice that ended WWI hostilities was followed by occupation of the Ottoman capital Istanbul, and military invasion of Izmir and the Anatolian Aegean region by Greece. The 1920 San Remo Conference and the subsequent Treaty of Sevres pretty much followed the Sykes-Picot formula. The fly in the ointment was Mustafa Kemal Pasha, later Atatürk, who led his Turkish nationalist forces to victory, expelling the Greek army from Anatolia, liberating Istanbul from enemy occupation, and establishing the Republic of Turkey. The 1924 Treaty of Lausanne obliged the 1915 conspirators to except the Anatolian heartland from their plans. Nevertheless, boundaries in the rest of the Middle East were redrawn more or less according to Sykes-Picot. Britain and France got their imperial ‘spheres of influence’, established puppet local governments, and laid the groundwork for the Zionist state of Israel – the main stumbling block to peace in the region. As for the claim (said to have been uttered by US President Obama) that regional hatreds and conflicts ‘date back millennia’, this is, at best, a blurring of the truth with ambiguous words. It may be that Biblical conflicts were fought two thousand years ago – but the Pax Romana enforced a peace that lasted pretty much until the oil age that began around the beginning of the 20th century. The creation of Israel in 1947 established a Jewish state that had not existed in any form for 1,815 years. Various Islamic empires controlled the Middle East, North Africa and even Spain for much of the time from the 7th century to the 20th. Admittedly control was established initially by conquest, but thereafter, citizens were allowed to follow their own religions and speak their own languages. The current mix of religions and cultures in the Middle East is surely testament to this. Of course, it is unfair to lay the blame for present conflicts on two imperial civil servants. Debate over the role of the Sykes-Picot Agreement is surely a red herring. Blame clearly rests with the imperial governments of Britain, France and Russia, who used their military and economic power to force their will on helpless and trusting people – and the emergent United States Empire that continued (and continues) that legacy into the 21st century.